Dear Daisy Cottage | Paper Glue Etc. I did an interview last week over at Tip Junkie and it was so much fun that when she decided to do a Mr. Linky this week I knew exactly who I wanted to interview. I actually would like to be this person when I grow up. She loves color! She is not afraid to take a risk. She decorates from her heart. She shares great ideas and encourages other women to “embrace THEIR color”. Pretty cool huh? She gives away some awesome giveaways. She accessorizes her pooch. Sounds like someone you want to call a friend doesn’t it? I openly admit that I read way too many blogs, it’s affected my reading of books, my housework, my exercise or lack of exercise program, my crafting time, my t.v. watching-you get the idea right? I have three different blog rolls on my blog check here, or here, or here to see what I love to read. Now I admit I don’t read all of those EVERY day, but there are a few that I read EVERY day. I have a few that I check sometimes more then once a day and Dear Daisy Cottage is one of those. Meet my friend KIM! Looks like you have been blogging for a couple of years. What has surprised you the most about your blogging experience? I guess what surprised me the most was that anyone visited my blog at all! What I have appreciated the most is how sweet and kind everyone is. I love my readers and sisters and brothers in Blogland to pieces – this community is one of the many things right with our world. I love the colors of your home, I’ve told you that before. I started this year adding “color” to my house (see my attempts right here). I find the process is so fun that I just know I’ll never be “done”. 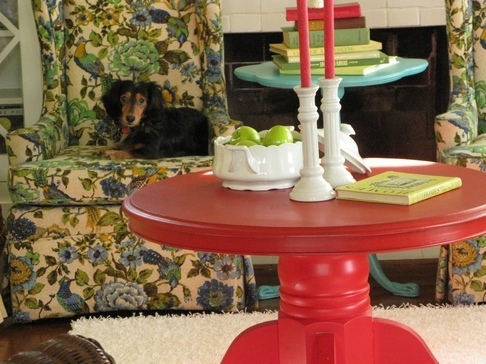 Have you been decorating your home in the yellow and red color scheme for a long time? I had always dreamed of living in a yellow house. Our previous home was decorated more in the yellowish-golds, cranberry-reds, and mossy greens. It was with this house that I went with the bold and primary colors. I have always had red in my wardrobe! I love daisies, I have a little daisy something in every room. You obviously love daisies also, why? Well, yes I do love daisies! They are unpretentious and I like their sweet simplicity! Children? Do they live close by? We have two children – a 25 year old son and an almost 20 year old daughter! Now how did that happen so fast? And yes I am very happy that they live close by! Your dog is so adorable. Is she well behaved? She looks so relaxed and calm in her pictures. Thank you! And Maggie thanks you too! 😉 She is a very affectionate, sweet little dog who loves allpeople and of course her beloved brother, Marley. Unfortunately, she isn’t too fond of other dogs but we are working on that – especially now that we have our fenced front yard. We are encouraging her to bark nicely as the neighbor dogs pass by! Maggie can be very mellow but don’t let her fool you – she IS a doxie after all and can be quite mischievous! You have some awesome thrift store finds, how much time do you spend thrift shopping? Any good advice for folks just starting to thrift shop? I love what she says here about it being “your home”. We pick up our mail at the post office, which happens to be oh so conveniently located near our Goodwill! I try to get the mail about three times a week and usually pop into Goodwill a couple of those times. I visit the thrift stores at random and my sis and I try to yard sale every Saturday that we can. My best advice for new thrifters is to know what you love and train your eye to see it. Also try to remember that furniture can be painted, cushions can be recovered, empty frames make great art, mix-matched dishes create the perfect set, and linens can be washed and used in so many ways to layer and embellish your home. The main thing is to have fun – don’t put pressures on yourself to find the perfect thing that you may be looking for. Sometimes it is just meant to be for you to find that cute little cup and saucer. Try to leave your wish lists at home and just go with the flow. Embrace the serendipity of your discoveries! Thank you so much! I’m flattered! I use a Canon PowerShot G9. I have zero professional training and have never read a manual! I am a point and shoot girl. I simply take the photos in the highest resolution and then crop them to size to fit my blog. I guess I try to capture what I am seeing at the moment. I love to know the blogs that other people read every day. How about five blogs that you read everyday? Oh please forgive me, because I am going to be a pain here! I try to read as many blogs that I can that are on my Blog Candy listand that varies from day to day and there are too many ones that I always read that I can’t just say five. I wish SO much that I could visit all of the beautiful blogs that are out there and if I could add every one of them to my Blog Candy page I would! Thank you so much Michelle for interviewing me! It has been an honor and great fun! This entry was posted in decorating, friends, life, organizing, photography, random thoughts, thrift stores, Uncategorized and tagged 2009 Word Organizing, decorating, friends, friendship, photography, thrift stores, thrifty decorating. Bookmark the permalink. YAY! Thank you so much for playing. It’s so great to get to know these amazing women isn’t it? I’ve become such great friends with the women I’ve interviewed in the past that I really wanted other’s to share in that experience. I’m so glad you reached out and participated in my little game. You Rock! Thank you! YOU are so sweet! AND a wonderful friend! I learned some new things about my friend and that’s always wonderful, so thank you! Love that Kim! She’s a great friend and a wonderful blogger too. The blog world is so much fun. Thank you for featuring one of my favorite bloggers. This was an interesting and informative interview. Well done! Pingback: Project Procrastinators Party The Before « Paper Glue Etc. What a wonderful interview with sweet Kim 🙂 You did an awesome job.